Let’s say you need to create an org chart. You know they have infinite uses—organization charts can help you show company hierarchy, illustrate a family tree, or capture the relationships between species—but you’re not sure how to get started. Luckily for you, Lucidchart makes it easy, just like any other diagramming task. Sign up free if you don't already have an account. 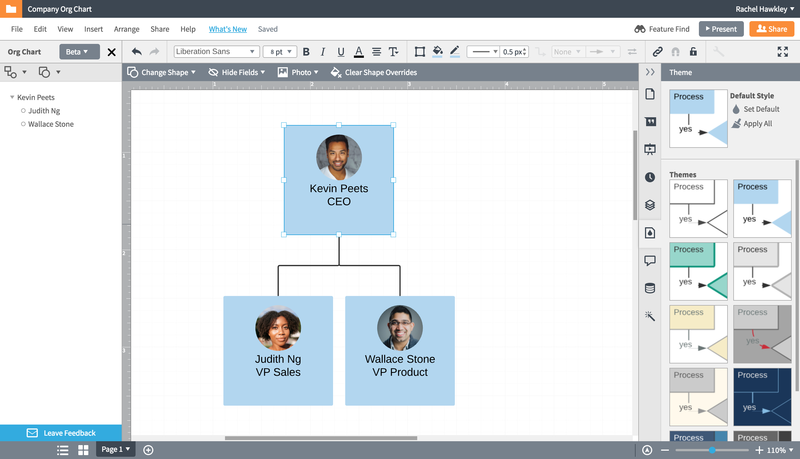 Then read on for step-by-step instructions on making an organizational chart with our org chart software for PC and Mac. To get started, you’ll first need to organize your content. What information are you trying to capture with your org chart? Where is it recorded now? You likely have a spreadsheet or list on hand that you can turn into an org chart. But if you don’t, try jotting down the basic elements of your chart before you begin diagramming. Once you know what information you need to capture, it’s time to start drawing. In Lucidchart, first turn on the org chart shape library by clicking "More Shapes" at the top of the toolbox on the left of the editor. Drag the org chart shape out onto the canvas, and the org chart editing panel will automatically appear on top of the toolbox. In the context panel, easily list out people in hierarchies using the Enter and Tab keys. As you form your list, the chart will populate shapes with the corresponding names. Open the org chart shape library. Identify columns for Employee ID and Supervisor ID. Match the rest of the columns to the org chart fields. Choose to create an org chart that shows the whole org or an org chart for a specific department. Click "Finish." 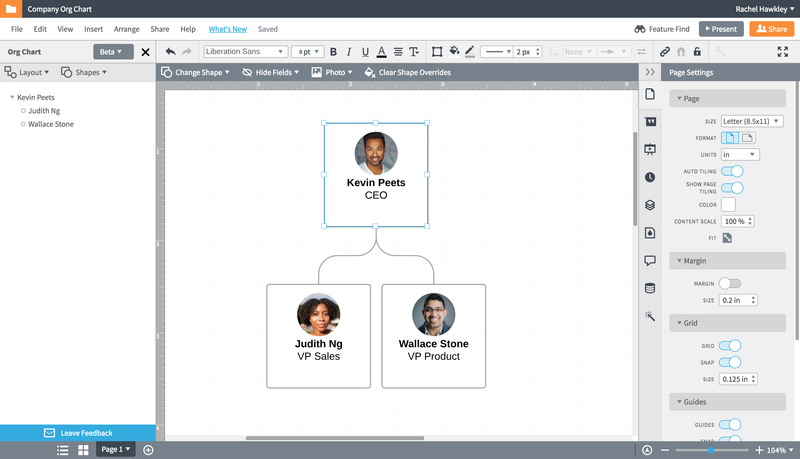 Customize your org chart with the "Layout" and "Shapes" options in the org chart editing panel on the left side of the canvas or the employee options bar at the top of the canvas. Using the org chart editing panel on the left and the properties bar at the top of the canvas, format the shapes and layout of your org chart. You can choose which fields are shown on the org chart and upload images (like employee photos). You can also try sprucing up your org chart with a color scheme which you can choose using "Themes" from the right-side dock. 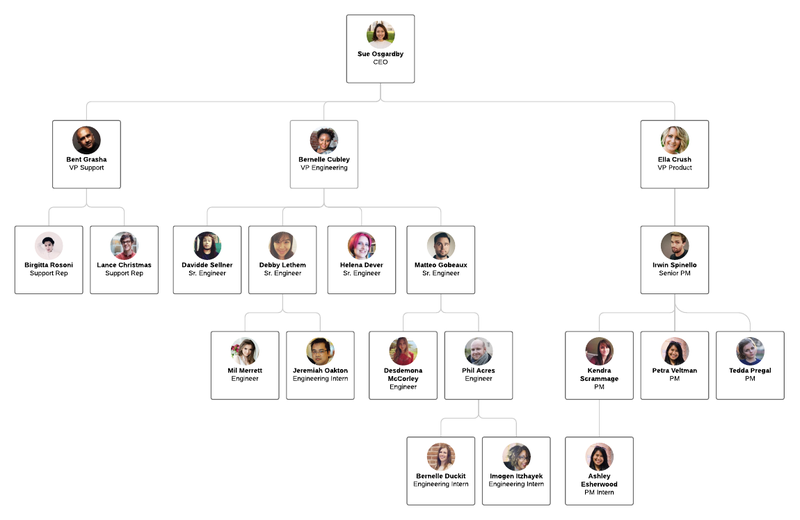 By putting a little extra effort into your org chart, you’ll be sure to wow your colleagues and present a polished company front!